The students, who attend Tri-Tech Skills Center, a vocational high-school campus in Kennewick, were only one group of many invited to the White House to show off their winning ideas and inventions. WASHINGTON — High-school students Stephanie Lopez, Chloe Westphal and Amanda Arellano knew they wanted to help teens curb the pressures and anxiety that lead to suicide and depression. The Kennewick teens didn’t know their innovative new app, Safe & Sound, would take them all the way to the White House. 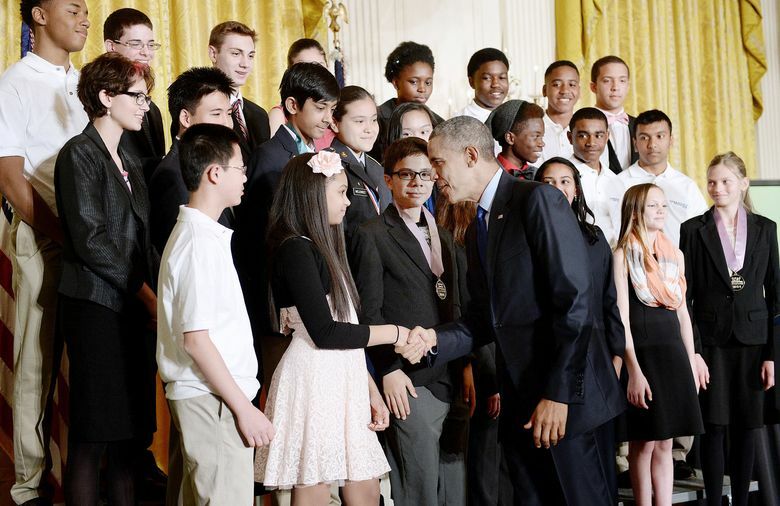 Lopez, Westphal and Arellano presented their invention Monday at the fifth annual White House Science Fair. Safe & Sound garnered national attention after the Verizon Innovative App Challenge awarded it Best in Nation. They entered the contest with a few other classmates in their “health informatics” class, a course that focuses on information technology as an untapped health-care resource. “When the teacher brought this to our attention, it sounded like something cool to do, but we didn’t expect anything to happen,” Westphal said. The three students, in addition to classmate Marina Stepanov, who was unable to attend Monday’s event, spent the past five months developing Safe & Sound, an app they think could help their peers deal with the prevalent stress, anxiety and ultimate depression that young people experience daily. “Since we’re teenagers, we have a unique perspective and an understanding of how it is because we’re right here in this moment right now,” Westphal said. Obama announced $240 million in new donations from businesses, universities and foundations to assist science, technology and math education through the White House’s “Educate to Innovate” campaign. “No young person in America should miss out on the chance to excel in these fields just because they don’t have the resources,” Obama said. Safe & Sound launches June 1 in the Google Play app store and will be free, in order to help “as many people as possible,” Westphal said. The Kennewick students received their invitation to the science fair two weeks ago, and attended with their teacher, Kristel Kinder. Their journey continues this summer in Dallas, where they’re to present Safe & Sound at a national conference of the Technology Student Association. The Safe & Sound science-fair exhibit featured statistics on school shootings, suicide-related emergency calls and suicide prevalence among teens. The students’ app prototype, which they developed with the help of a Massachusetts Institute of Technology graduate student, features four graphics that represent different resources: a list of hotlines for crisis relief, information on how to handle overwhelming feelings, calming exercises and inspirational quotes to promote resilient attitude, and a journal. Also in attendance at Monday’s science fair were various administrative officials and celebrities, including the president’s science adviser, John Holdren; NFL wide receiver Victor Cruz of the New York Giants; and the science guy himself, Bill Nye.